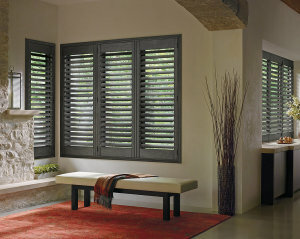 Blinds & Drapery showroom offers a full line of interior and plantation shutters to suit any need. Our Hunter Douglas line includes the stunning Handcrafted Series of Heritance® hardwood shutters – a selection of six artisan techniques that enhance the inherent character and color of the genuine hardwood. Techniques available: Glazed, Glazed & Burnished, Classic Distressed, Heirloom Distressed, Rustic and Textured. The value-priced NewStyle® hybrid shutters blend the beauty of real wood and advanced modern-day materials to create a stunning and durable window covering for any room. The Finetech® Finish coating provides a lasting, micro-smooth satin finish that makes cleanup as simple as dusting with a soft, dry cloth. Our Palm Beach™ polysatin shutters are constructed with UV resistant vinyl, so they’re guaranteed never to warp, crack, fade, chip, peel or discolor, regardless of extreme heat or moisture. The DuraLux™ Finish provides a look that is virtually indistinguishable from a finely painted shutter. The finish is scratch and dent resistant. It never needs sanding, staining or painting. Give us a call today to schedule your in-home shutter consultation and measure. © 2016 Blinds and Drapery Showroom. All Rights Reserved. Proudly serving Havertown, Bryn Mawr, Ardmore, Newtown Square, the surrounding Main Line area & beyond.